Lucinda Chapdelaine’s story begins with a royal ball—but not in a dancing-and-glass-slippers sort of way. Her parents stepped into a coach, went to the ball, and never returned. As a young orphan, Lucinda was sent to live with her uncle and evil stepaunt in their lonely jewelry shop. Now, years later, a single magical moment is about to change her life once again. On an ordinary day in the shop, Lucinda encounters a handsome young gentleman, a mysterious woman, and an unusual gem. The gem has unbelievable powers and the gentleman is a prince, but it is the mysterious woman who will prove most valuable. She is none other than the Amaranth Witch, and she has a daring task for Lucinda. If she succeeds, Lucinda with reclaim what is rightfully hers, find a true friend, and perhaps discover her own happily ever after. 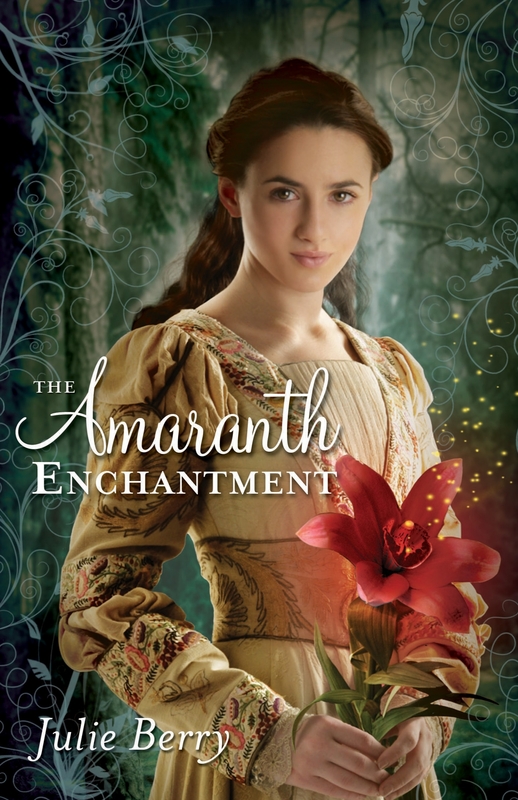 In The Amaranth Enchantment, there are all of the familiar fairy tale elements: an orphaned girl, a wicked stepmother, a witch, a prince, a prince who doesn’t know he’s a prince and an unusually smart animal sidekick. I suspect Julie Berry has loosely (very loosely) based this book off the Cinderella story, but she adds one twist: the fairy godmother is an alien. Other than that little twist, the book is pretty much exactly the same as many of the books that have jumped on the fairy tale bandwagon. Don’t get me wrong—The Amaranth Enchantment is a decent enough book. But the plot becomes very random and the pacing is inconsistent near the end, like Julie Berry suddenly wanted to write an action novel. Not only does the pacing become inconsistent, the climax grows ever more cliché-filled as it progresses. I love a happy ending as much as the next person, but this ending feels very rushed and really doesn’t give many hints at to what happens to the characters. Julie Berry’s characterization is adequate, but it is not spectacular. Lucinda is a believable character and I can sympathize with her, but for whatever reason, she lacks a sense of uniqueness that distinguishes good characters from memorable characters. My impression of Lucinda is basically the same as my overall impression of The Amaranth Enchantment: good enough, but not memorable by any stretch of the imagination. Great first review! Welcome to We Heart Reading!